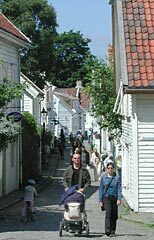 Stavanger is a small city with BIG charm. It has a perfect harbour setting, history and culture, excellent restaurants, lots of shops and good accommodation. Close to mountains, fjords AND sandy beaches, it is the norwegian oil capital. 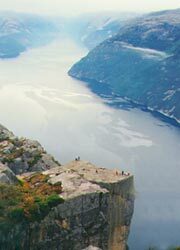 Bergen is Norway's second city, set amongst mountains and harbours. 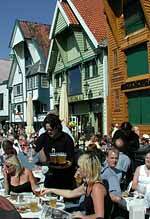 The bryggen area of old wooden sea-houses is a UNESCO world heritage site. Kristiansand is the centre of the south coast, or "sørlandet" area, with thousands of inlets to explore - very popular for boats and fishing. South west Norway has stunning, beautiful countryside - spectacular fjords, waterfalls, mountains, lakes and a unique coastline. 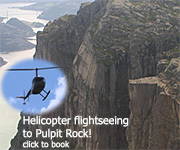 Work or leisure, vacation or short break, tourist or resident, you will find something of interest here. "Take a trip" around the pages of the flavour section of the site - start in Stavanger or Bergen - and click on the tour bus image to the next page. Find out what the top ten trips out are this month. You get search results for accommodation by room - not only by hotel - and we think you'll like it. Now you can see a growing collection of weekend breaks in the region.